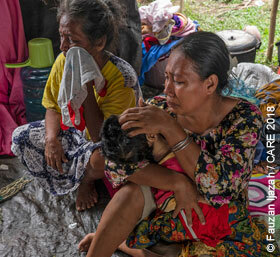 Nauris cries while comforting her 4-year-old daughter, who has been suffering from diarrhoea. Nauris and her family have been living in this tent after their house, in Balumtuma village, Donggala, was destroyed by the earthquake. On Friday 28 September 2018, multiple earthquakes hit the island of Sulawesi in Indonesia. The largest of these was a 7.5 magnitude earthquake that triggered a tsunami which devastated the northern coastline, including the densely populated Palu city and the nearby Donggala district. In July and August 2018, powerful earthquakes brought devastation to Lombok island, and on 23 December 2018, following an eruption on Mt Krakatoa, a tsunami smashed into the coastlines along the Sundra Strait - the third disaster to hit the people of Indonesia inside six months. Read more about CARE's response in our press release CARE distributes 200 hygiene kits amidst fear of further tsunamis and aftershocks in Sunda Straits. While most places have now received some form of support, large numbers of people are still living on roadsides without adequate shelter. The Government has worked quickly and tirelessly to assist survivors, but there is still a way to go in making sure the people in Central Sulawesi have all the basic items they need, let alone being able to rebuild their lives and livelihoods. On top of all the damage and destruction caused by the tsunami, the rainy season has now begun in earnest, and cases of disease outbreak are rapidly rising. Women have told us that inadequate toilets, a lack of privacy, a lack of lighting, and toilets being too far from shelters, particularly at night, are some of their major concerns. Please donate now to the Indonesia tsunami appeal. 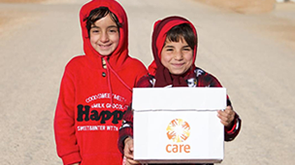 CARE’s immediate priority is to provide water, sanitation and hygiene support as well as emergency shelter kits. In particular, we will also be looking at the earthquake’s impact on women and girls and developing assistance that will support them. CARE is aiming to support up to 50,000 people - mainly in Donggala, one of the most difficult areas to reach and the least likely to receive needed assistance. Once people’s immediate needs are being met by the emergency response, CARE will work with the Indonesian government and other charities to support the survivors to rebuild back their homes and their livelihoods. CARE International is a member of the Disasters Emergency Committee and CARE Indonesia has worked in this part of Indonesia for 30 years. On Friday 28 September 2018 multiple earthquakes hit the island of Sulawesi in Indonesia. The largest of these was a 7.5 magnitude earthquake that was centred near the densely populated Palu city in the north central part of the island. This triggered a tsunami with 3 metre high waves hitting many coastal areas. More than 2,000 people are confirmed to have died in the earthquake and tsunami, with many more people still missing or unaccounted for. An estimated 65,000 homes were destroyed or damaged. There is huge damage to infrastructure like roads, water and sewage systems, and public buildings such as hospitals. Around 1.5 million people are estimated to be affected by the disaster. In the immediate aftermath, many people are sleeping in communal shelters, or out in the open. Access to safe drinking water is a particular problem as water supplies are damaged. The immediate needs are life-saving support with food, water, and shelter. Longer term support will be required for rebuilding homes and helping people to regain sources of income and livelihoods. We are aiming to support up to 50,000 people, mainly in the Donggala area north and east of Palu - one of the hardest hit areas, and the most difficult area to reach. We have been distributing hygiene kits through our partner organisation PKPU to households in the worst affected and hardest to reach areas of Palu, Donggala and Sigi. CARE’s hygiene kits include buckets and water purification tablets as well as hygiene items such as soap and laundry, and items specifically targeted at women and girls, such as sanitary napkins. Our emergency response will focus on the specific impacts on women and girls who are often disproportionately affected in disasters and crises, including being at increased risk of various types of sexual and gender-based violence. Their voices are often also the least heard when it comes to emergency needs and a say in the type of support they require. We will be ensuring safe spaces for women and girls so they have access to accurate information and support services. Our response will provide assistance with water, safe toilets and hygiene; and immediate shelter needs. In the longer term, we will be supporting rebuilding through training local people to build back safer, using locally sourced and appropriate materials - an approach that we have used successfully after the Nepal earthquakes and Typhoon Haiyan in the Philippines. We anticipate that our response will continue over a four-year period and will include support, particularly for women, in regaining livelihoods and sources of income. Read the latest emergency updates on our Crisis Watch page.